New Onkyo TX-NR686 is a well-equipped 7.2-channel AV receiver | What Hi-Fi? Priced at £650, the 165 watt-per-channel AV receiver offers vast wireless, multi-room and hi-res network music possibilities, as well as 4K, HDR, Dolby Atmos and DTS:X support. On paper at least, the Onkyo TX-NR686’s chances of keeping up this year’s batch of AV receivers in the midrange market look good. It’s well specified on both video and audio counts, to say the least. In addition to playing native DTS:X and Dolby Atmos soundtracks, the THX-certified TX-NR686 has DTS Neural:X and Dolby Surround upmixers to create virtual 3D sound from legacy DTS or Dolby formats. Those with Atmos speaker set-ups can benefit from the AccuEQ calibration software's AccuReflex technology, which is designed to phase-match directional and non-directional sound played though Atmos-enabled systems. Six HDCP 2.2-compatible HDMI inputs can pass through 4K and multiple HDR formats, including HDR10, HLG and Dolby Vision, with a seventh socket sitting on the front panel. A second zone of operation also allows owners to run a separate pair of speakers in, say, another room, for simultaneous playback of the same (or even a different) source to the main zone. On the music side Spotify, Tidal, Amazon Music, Deezer and TuneIn network services are all part and parcel of the Onkyo’s networked offering, accessible via the Onkyo Controller app. Seemingly covering all bases, its support also extends to the wireless, multi-room DTS Play-Fi and Onkyo- and Pioneer-developed FlareConnect streaming platforms, as well as Google Chromecast, AirPlay and Bluetooth. Onkyo says playback of 5.6MHz DSD and 24bit/192kHz PCM files over network or USB input benefits from Vector Linear Shaping Circuitry, which is designed to remove noise and optimize clarity during playback of those hi-res formats. Last but not least, an moving magnet phono stage caters for a turntable hook-up too. 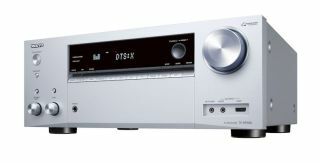 The Onkyo TX-NR686 will be avalable from April - which we hope isn't long after we get the chance to take it for a spin. Win a pair of Spendor A4 speakers worth £2200!